It’s easy to get googly-eyed by the onslaught of amazing green design out there these days. 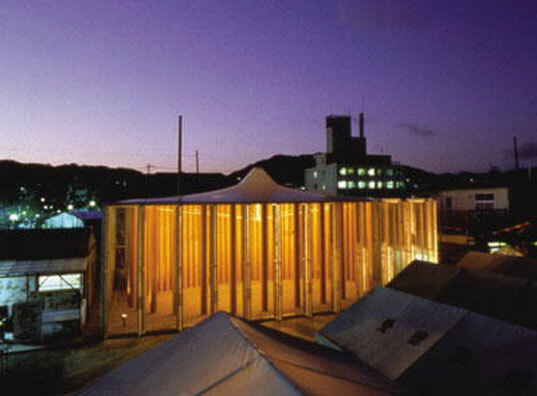 But it’s also important to look back a bit at some of the architectural precedent and acknowledge a building like Shigeru Ban’s Paper Church as the forward-thinking innovative design that it was. Built in 1995 and disassembled in 2005, the Nagata-Ku church in Kobe, Japan was built by church volunteers whose house of worship was destroyed by the 1995 Kobe earthquake. Using 58 paper tubes, the church is simple in its elliptical shape, but a dramatic spatial experience that turns low-tech materials into spiritual space. All the church’s materials were donated and construction was completed in only five weeks by the 160 volunteers. In plan, the church’s elliptical form is based on Bernini’s church designs. After the church’s disassembly in 2005, all the materials were sent to a city in Taiwan for reconstruction. Here’s a great example of inexpensive, innovative design for a post-disaster context, proving that emergency architecture needn’t be sterile, ugly, ungreen, or pricey. I like it, without patterns consumism, totally clear and new concept. I question, the architecture paper use come envolvemnts, ¿where i can see more about this? Holly, This is a very difficult thing to do. I think the goal of attracting younger people to church is a matter of church dogma and should not be a design problem. To do so would render your design and the church you are designing it for as a situationally locked as any fashion or trend that we young people cater to. Don't fight this through shallow design trends, they age fast. I love all of these. they're beautiful i am actually designing a church now and these have really helped me. if you have any suggestion on how to attract younger people to church please e-mail me. Nice work:) Bibi Rogers - no need to cut trees to make paper tubes - wood industrial waste can be used. Fabulous..... but how many trees got choppes to make these 56 paper tubes? I love it! But I've often wondered what happens to traditional Japanese paper construction in high humidity or rainy conditions. Do the building members change dimensions? It's easy to get googly-eyed by the onslaught of amazing green design out there these days. But it's also important to look back a bit at some of the architectural precedent and acknowledge a building like Shigeru Ban's Paper Church as the forward-thinking innovative design that it was. Built in 1995 and disassembled in 2005, the Nagata-Ku church in Kobe, Japan was built by church volunteers whose house of worship was destroyed by the 1995 Kobe earthquake. Using 58 paper tubes, the church is simple in its elliptical shape, but a dramatic spatial experience that turns low-tech materials into spiritual space.